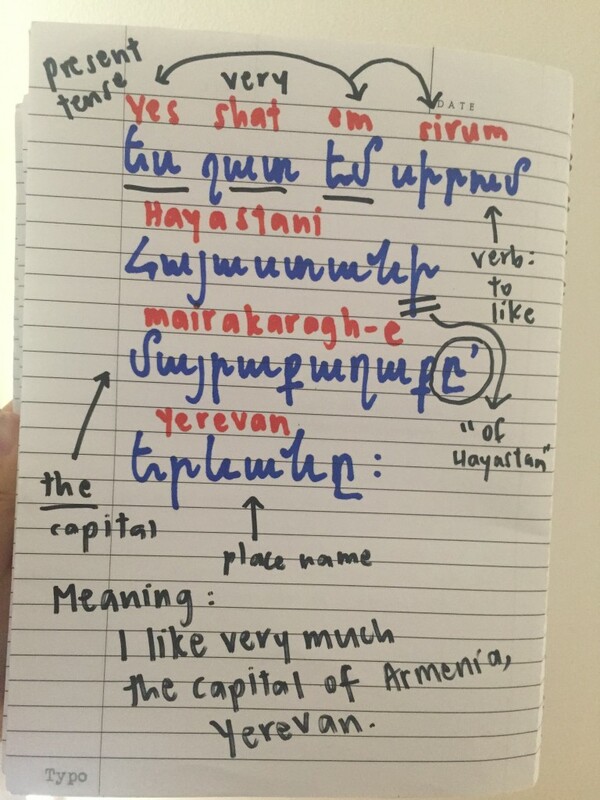 In her previous article, Karmun Khoo had to introduce herself in Armenian in front of her entire class. 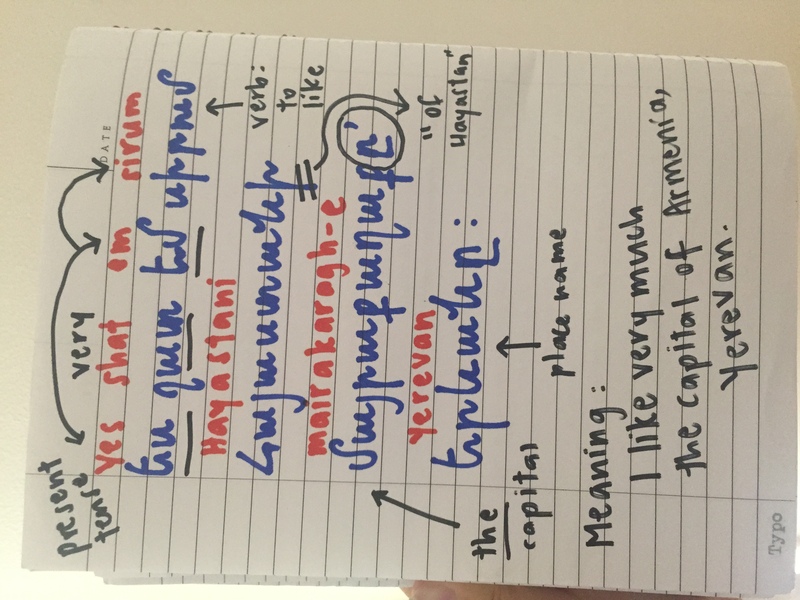 This week, she’s offering up some tips for those of us who are also learning Armenian. While interacting with you wonderful Armenite readers, I’ve noticed that, whether it’s families trying to pass on the mother tongue to their children or people in the Diaspora trying to teach themselves the language, others are in the process of learning Armenian too. In the interest of helping those who, like myself, are new to this complex language, I have compiled some tips. First things first: It’s much easier to speak and read Armenian than it is to listen and write in it. This may be due to the largely phonetic nature of the script, which helps learners sound out words they might not understand. The lilting, conversational rhythm of Armenian also lends itself well to conversation – assuming you can understand what your partner is saying! 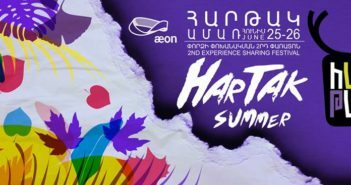 However, because Armenian speech is fast by anglophone standards, deciphering radio broadcasts or TV programs can be challenging. If you find yourself struggling with listening and writing Armenian, the best thing to do is print out the transcript of what you’re listening to and annotate the Armenian text as you hear it. Write down pronunciations and definitions of new vocabulary and then read out the text without listening to any recording. This helps you associate the characters with their pronunciations and meanings. This intellectual “kochari,” or Armenian folk dance, can be rather frustrating, as I’ve implied in previous articles. However, all of these suffixes, declensions, and verb conjugations combine to create a language of incredible clarity. Armenian is similar to Latin, in that word order is fairly flexible; If history had been kinder to the country, we might be using Armenian as a European “lingua franca” today rather than Latin. The Armenian question mark is also a true work of genius. 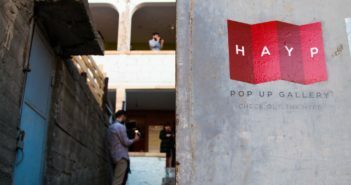 Instead of appearing clunkily at the end of a sentence, like in English, or framing the borders of the interrogative phrase, like in Spanish, the Armenian question mark is an unobtrusive open circle, placed before the last vowel of the question-word. For example, “inchpe’s” doesn’t just mean “how” — it means “How?” While English text would be thrown into confusion if the ends of each sentence disappeared, the Armenian language embraces such delicate characteristics. This is all very nice, I can hear you saying, but how are new learners supposed to take advantage of these linguistic features? How can we possibly learn all these intricacies? The key is to integrate these peculiarities into your note-taking and make them part of your acquisition process. When I encounter suffixes, I underline them and explain them in the margins. Take the example below, in which I have annotated and translated an Armenian sentence. It may not work for everyone, but I’ve used this tactic to learn languages like French, German, Spanish, Latin, and now Armenian. Another useful tip is to create your own textbook. This seems like a Herculean task, but it’s actually quite straightforward. In most language-learning methods, phrases like “It is half past one” are provided in each lesson. However, if you just write down that single phrase, without learning to modify it to suit your needs, you’ll never be able to tell the time if it’s not exactly one-thirty. When I see a phrase, I write down several variations in my notebook: “It is half past two”… “It is a quarter to ten”… “It is three o’clock.” These three sentence patterns can then be substituted with almost any number on the clock in order to tell the precise time. Lastly, language-learning websites and forums usually give out elusive snippets of advice. 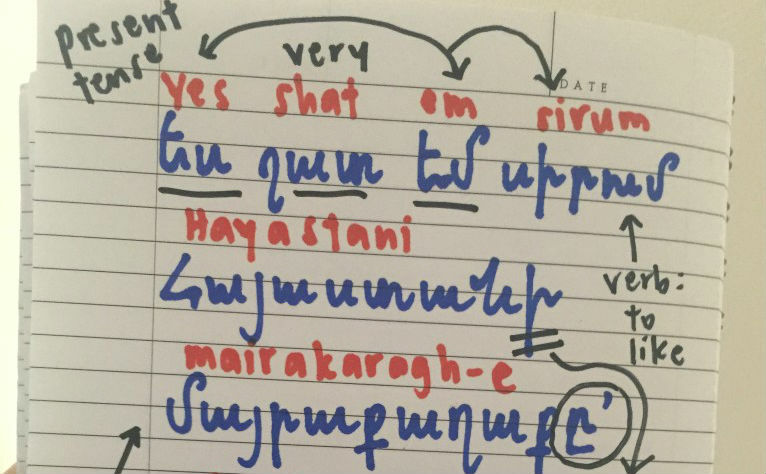 We are commonly told to “practice regularly” and “immerse ourselves” in our target languages, but the most practical thing you can do to get closer to the heart of Armenian would be to study its linguistics. Grasp what a suffix is and what it does. Understand conjugations, first-person pronouns, and so on. Learning Armenian is no different from learning chess. Just as chess novices must learn the relative values of each game piece (a knight is three points, in case you were wondering) Armenian language enthusiasts must pick each word apart with a diligent fervor. If this all sounds like a lot of hard work, that’s because it is. It reminds me of the Armenian proverb: “To be willing is only half the job.” The other half is a mixture of hard work (annotating each lesson and copying out grammar tables) and smart work (actually understanding what’s being written down and coming up with little tricks to help your memory.) In the Armenian spirit, I wish you all good luck. The first thing I ever did was create a notebook completely dedicated to Armenian. 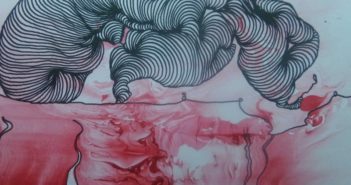 A great tip, and great read Karmun! Ապրէս!